Max Robert and Lee Porena. Photo: Disclosure. Dolores Duran fans will have a great opportunity to go to the Sesc Sorocaba: the reason is a show in tribute to her the day 14 November, Saturday, at 8:0 pm, at the theatre. The presentation, entitled "because of you", will be played and sung by Max Robert and Lee Porena. Tickets are available at the Customer Center and in the portal sescsp.org.br/sorocaba. The values range from R$17 (entire), R$8 (half – for students, retirees, servers public schools and people with more than sixty years) and $ 5 for full credential. The duo will play only songs composed by Dolores Duran, In addition to passages in the life of songwriter and declaim their poems. Thus, the tribute takes a cozy atmosphere and lyrical, well the taste of night clubs frequented by the Bohemian lifestyle of the Copacabana fifties. 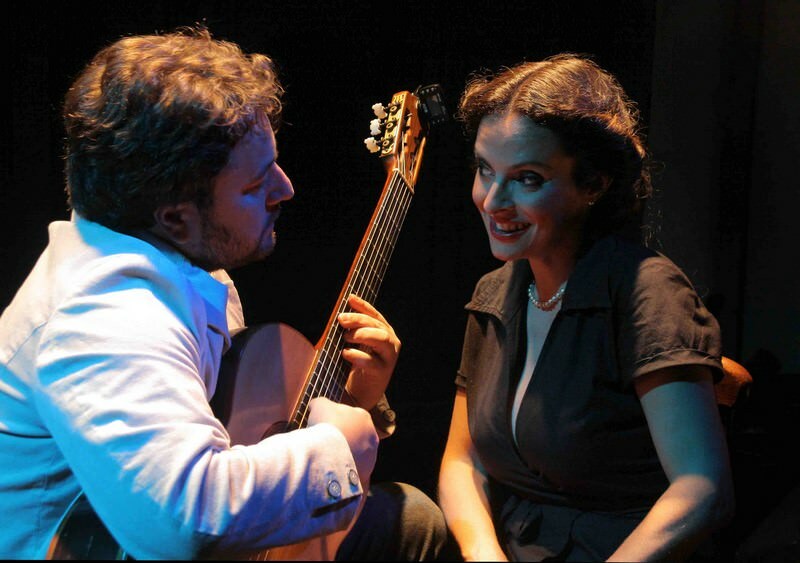 The show "because of you" brings to the scene the work of this artist who died at the age of 29 years and that gave life to verse anthologies, leaving a work flawlessly for the base of Scripture popular music Brazilian female Poetics. Among the songs, are classics such as "Highway of the Sun", "Because of you" (It was composed in partnership with Tom Jobim) and "the night of the baby", that this show will be presented with a contemporary drapery. The duo uses a guitar training, voice and virtual instruments. Dolores Duran (1930 – 1959), Adiléia Silva, better known by his stage name of Rock, It was a Brazilian singer and songwriter. Dolores began singing at the age of three. To five, attending the festivals and at twelve he played at the Theatre from Aunt Chiquinha, a children's show on radio Tupi carioca. In 1951 He recorded his first album with Samba. Shortly after, in 1954, He recorded a series of successes in boxers, such as “Tradition”, Ishmael Scott, and “Praca Maua”, Billy Blanco. In partnership with Tom Jobim, He composed his first song: “If it's goodbye”, written by Doris Miller. March 1957, Dolores was delighted with “Because of you”, a melody of Jobim with lyrics by Vinicius de Moraes, and made a version with alternate lyrics. In 1958, After a tour of the then Soviet Union and Paris, composed “Punishment”, a samba-song that was successful in the voice of the singer Maysa. In 1959, at 29 years old, Dolores Duran passed away in her sleep. The culture developed after his death, his songs were re-recorded by different musicians, as Lúcio Alves, that in 1960 released an album featuring music by Dolores; by the American Frank Sinatra, who recorded the version of “Because of you”, with the title “’ Don t Ever Go Away” in 1971, among others. Max Robert and Lee Porena. Photo: Joyce Candido. Max Robert is paulista, living in Rio de Janeiro. He was a member of the Rock Group "the Rosary", is partner of the site of artists such as Danilo Caymmi, Guinga and singer Jane Duboc. Her discography makes five solo albums, two of them released with the group "the Rosary". Is responsible for arranging the show "because of You" and the track "Suspicious" of marriage Ariano Suassuna. Lee Porena began singing in bars with MUSIC groups, recorded, in 2005, a participation in the CD "Bossa" next to Danilo Caymmi, Guinga and Jane Duboc. In 2007, participated in the Argentine Brazilian music documentary "Music Del third millennium". In 2009, debuted his solo show "because of You". Traveled by Brazil as special guest of the show "instruments and songs", Max Robert and Guinga. In 2011, He participated in the revival of the operetta "Tapuya Flower", Pixinguinha and in 2012, the Brazilian musical "Stories of Alexander", based on the work of Graciliano Ramos, in the Centro Cultural Banco do Brazil in Rio de Janeiro and Brasilia. $ 5.00 – Full Credential – Worker of trade in goods, services or tourism at SESC and enrolled dependents. U $ 4.00 – Half price for students, public school servers, people with more than 60 years, retired or disabled.